"Just get on with it," advises Irish-born and -bred John Tierney, one of the Serpentine Swimming Club regulars who frequents the famed British lido in Hyde Park. "Isn't it just lovely with the fog?" remarked Tierney after one of his early morning workouts in the Serpentine, said as more of a statement than a question. 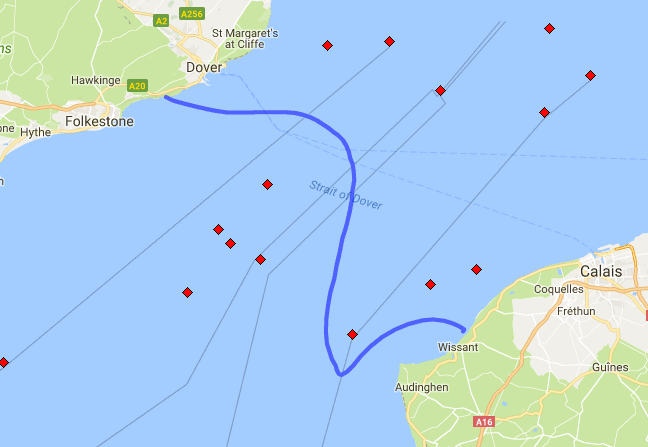 After a number of relay swims across the English Channel and swims from Turkey and Italy to South Africa, Tierney finally grappled with a crossing of Windermere in the Lake District of England and the English Channel. 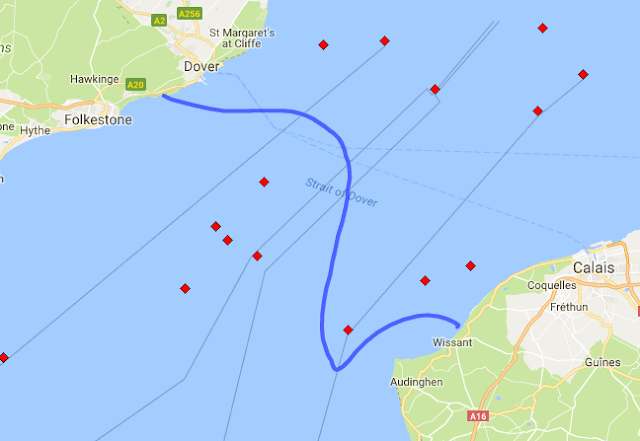 He knocked off both of them within a 5-week span: a 6 hour 27 minute 16.8 km crossing in 16°C water in Windermere and a 14 hour 37 minute crossing from England to France [course shown below]. Splashing past chlorinated lane ropes, with very little to mull. Like many a dry-docked Londoner, it’s the Serpentine for me. Translucent arcs, are water-carved, by the open water swimmer. You shrink your skin, and freeze your bits, to move in icy waters biting. And when the changing room is full, we’re noisier than the lark. 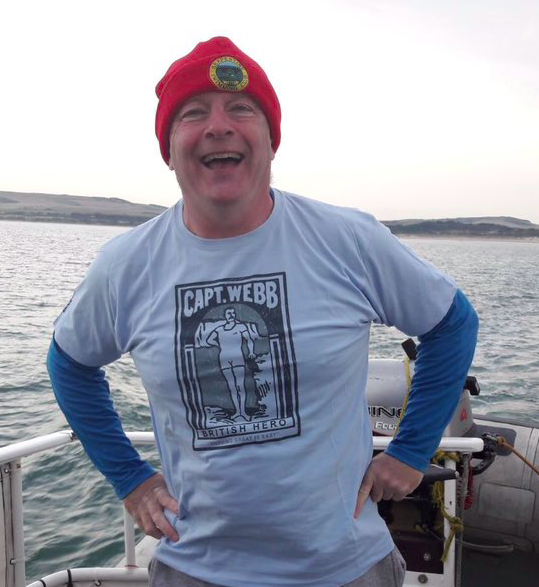 Big respect for Captain Webb who created English Channel Rules. In the month of May, in the Serpentine, what differs from the pool? White swans glide past sedately, with ease and aquatic cool. As if they walk on water, dirty geese should act their age. But don a hat and skimpy trunks and trust in human blubber? Just jump right in and do our swim and then get out more humble. And Robin’s three thermometers confirm that swimming now is easy. The mercury sits at 61, which in Celsius means sweet 16. All open water swimmers reliving Captain Webb’s 1875 dream. Squirming in bulky neoprene, is a sensation we don’t lack. For bird or swift or swimmer, one swallow doesn’t make a summer. Dappled sunlight lances low, as military horses are schooled by hand. I wonder what our equine friends make of those rubber battalions? Why are these zealous floaters half submerged for rubber dunks? But for purists, hot tea and hot gossip, this is our only codology. Of course there are those times when some of us suffer the shakes. But it’s English Channel rules if you have what it takes. Good luck to those rubber duckies, perhaps they’re sporting hunks? And sometimes have hot breakfast where sincere chat abounds. And swimmers, dressed, refreshed, move along, full, fired up and able. And live like impervious mortals the rest of the day on dry land. And he’ll skim to our hero Captain Matthew Webb, for the English Channel Rules.